You can listen to Stiofán’s reading here. Stiofán Ó Cadhla was born in Ring. He is Head of the Department of Folklore in UCC. He has published two collections of poetry An Creidmheachach Déanach and Tarraing Na Cuirtíní, A Dhochtúir, both with Coiscéim. He won the Michael Hartnett Award in 2012. Rugadh Stiofán Ó Cadhla i Rinn Ó gCuanach agus tógadh ansan agus i mBaile an Easpaig ar imeall chathair Chorcaí é. Ba é An Creideamhach Déanach (Coiscéim 2009) an chéad chnuasach filíochta aige. Bronnadh Gradam Filíochta Mhichíl Uí hAirtnéide air sa bhliain 2012. Foilsíodh an tarna cnuasach Tarraing na Cuirtíní, a Dhochtúir (Coiscéim 2012), bronnadh duais aitheantais sa Chomórtas Filíochta i gComórtas Liteartha an Oireachtais 2012. You can listen to Fernando’s reading here. Over the course of the years, Fernando Beltrán has published over 15 poetry collections. Some of his works have been translated into 15 different languages and his entire repertoire has been translated into French by the publishing house ‘L’Harmattan’ in a book entitled L’Homme de la Rue. While this means you don’t have to visit Spain to read his works, it is still best to take some Spanish classes to be able to read his works in their original form. He was born in the city of Oviedo, in the green and rainy region of northern Spain called Asturias in 1956, however his family moved to Madrid in 1964, which is where the poet now lives. In 1980, Beltrán became one of the founding authors of Sensismo, a poetry movement that signified a generational rejection of the cultural aesthetic tendencies of the Novísimos in the 1970s. In 1982, Beltrán’s literary fame kicked off as he won the runner-up prize in the Premio Adonáis competition with Aquelarre en Madrid, which has since been re-edited on numerous occasions, becoming a benchmark of his poetic generation. The poetry of this Spanish author became clear in two manifestos. In 1987, he published the first, Perdimos la palabra (We lost the word), in the daily newspaper El País, meanwhile the second manifesto, Hacia una poesía entrometida’, (Towards a meddlesome poetry), appeared in the magazine Leer later, in 1989. The second article is much more important for understanding this poet as the ‘interfering’ poet that he defines himself as. Beltrán also founded the Aula de las Metáforas, a poetry library to which the contemporary Spanish poet has donated 2500 works. The library can be found in the Casa de Cultura in Grado in the region of Asturias. At this present moment, he is the director of the poetry magazine, El hombre de la calle. As well as being a poet, he is also a professor at the European Institute of Design and the Escuela Superior de Arquitectura. Aside from his work in literature, he also founded the business ‘El Nombre de las Cosas’, a studio which helps come up with names for new companies. Although at first many people thought he was mad, Beltrán has actually had a great deal of success with this company. Among some of the brands the company has created, one can find Amena, Faunia, OpenCor, Cruzial, rastreator, La Casa Encendida, etc. You can listen to Cormac and Julie’s complete performance here. First Fortnight is a charity that challenges mental health prejudice through arts and cultural action. Cormac Lally and Julie Goo first met at The All Ireland Poetry Slam Final 2014 in Kilkenny. This was the beginning of a literary adventure for both, for better or for worse. GooLally Productions was born in the summer of 2017, when both poets combined their work into a show entitled Me, Myself and Ireland. This show went down a storm on Sherkin Island in August 2017 and is due to travel to travel the country over the coming year. GooLally Productions have created a unique show for the First Fortnight event at Ó Bhéal, where each poet will explore life experiences which have impacted on their mental health. Expect honesty, darkness, hope and a good dose of humour. Cormac Lally is one of Ireland’s top spoken word artists and performance poets. His work has been featured on RTE’s Arena and the Moncrieff Show. He has opened for Liam O Maonlai, Luka Bloom, Mick Flannery, Ye Vagabonds, RíRá, Martin Hayes and Denis Cahill, as well as performing all over Ireland at the countries’ biggest festivals. In 2015 he became the first poet to win two different Provinces of the All Ireland Slam Poetry Championship winning in Munster after having won Leinster the previous year. In 2016 he teamed up with Julie Goo, Sean Denehey and Stan Notte to create the show Poets of the Revolution, a show which poetically examined Ireland in 1916, 2016 and 3016. This sold out show was part of the Quarter Block Party Festival in Cork and was described as being “magical, insightful and full of colour”. Lally’s collections Scribbles, Dribbles and Homegrown Nibbles and Too Busy Dancing are sold worldwide. He lives and works in Skibbereen, Co. Cork. Julie Goo is a Cork-born bilingual writer and singer. In 2012, her chapbook Spoken Worlds – lost in print was published, and she was one of two Cork poets chosen to represent Cork in Coventry for the Annual Twin Cities Exchange. Goo has performed at a wide range of festivals and events including: TedX Cork, Winter Warmer, Lesbian Lives Conference, Circus Factory, Ó Bhéal, Electric Picnic, Valentia Isle Festival, Indiependence, Body & Soul, Live Words, Support Act to Panti Bliss at St. Luke’s, Connolly’s of Leap, The Quarter Block Party, Eastrogen Rising, The Kino, and Cork Midsummer Festival. Goo was crowned Munster Slam Champion in 2012, and has represented Munster in The All Ireland Slam twice. Her slam poetry is socially conscious, politically driven, uplifting and open hearted. As a primary school teacher, who is passionate about inclusive, Educate Together Education, Julie also gives writing workshops to kids. Her motto in life is ‘I’d try anything twice’. Check out Julie Goo’s facebook page or email juliegoopoetry@gmail.com for a list of upcoming events. Doireann Ní Ghríofa is a bilingual writer whose books explore birth, death, desire and domesticity. Her poems and prose regularly appear in literary journals in Ireland and internationally. Among her awards are the Ireland Chair of Poetry Bursary, the Rooney Prize for Irish Literature, the Michael Hartnett Award for Poetry and Scotland’s Wigtown Award for Gaelic Poetry. She frequently participates in cross-disciplinary collaborations, fusing poetry with film, dance, music, and visual art. Recent/forthcoming commissions include work for The Poetry Society (Britain), RTÉ Radio 1, University College Cork, and The Arts Council/Crash Ensemble. Doireann’s third collection Clasp (Dedalus Press, 2015), was shortlisted for the 2016 Irish Times Poetry Award. She writes “with tenderness and unflinching curiosity” (Poetry Magazine, Chicago). For more about Doireann, visit www.doireannnighriofa.com. You can listen to the complete FIRED! performance here. In the fifties The Oxford Book of Irish Verse was published, edited by male poets Lennox Robinson and Donagh MacDonagh. The anthology contained work by eighteen women, which was pretty good going for the time. In 1986, Thomas Kinsella edited The New Oxford Book of Irish Verse. It contained work by one woman – from the Irish, in translation. Kinsella was the translator. 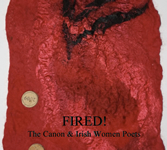 Irish women poets are coming together all over the country to host Fired! readings, discussions and events. This is not an isolated event, but part of a disturbing pattern which has emerged in Irish literature over the decades. This year, the publication of the Cambridge Companion to Irish Poetry has been something of a last straw. We will be reminding the Irish literary world about the beautiful work and talented poets who have been erased from the canon of Irish literature. We want to discuss why this happened, and how we can stop it from happening. We want more than anything to celebrate these women and their words. Audience members will have the opportunity to participate and read at the open-mic, and work by forgotten poets will be available to read from. Born in Dublin, where she still lives, and educated at Trinity College and in the United States, Paula Meehan, has published seven award winning collections of poetry including Dharmakaya and Painting Rain. She has written plays for both adults and children, notably Cell, a play about women prisoners, and The Wolf of Winter, an ecological fairy tale. Music for Dogs collects three plays concerned with suicide during the economic boom years in Ireland. Dedalus Press have republished Mysteries of the Home, seminal poems from the 1980s and the 1990s. In 2015, she received the Lawrence O’Shaughnessy Award for Irish Poetry. She was Ireland Professor of Poetry 2013-2016, and is a member of Aosdána, the Irish Academy for the Arts. Two recent volumes are Imaginary Bonnets with Real Bees in Them, her three public lectures given as part of the Professorship, from UCD Press, Dublin, June of 2016, and Geomantic, a long poem in 81 parts (Dedalus Press, Dublin, November of 2016). In 2017 she received a Cholmondeley Award for Poetry.